Sumter County is a county of the U.S. state of Alabama. As of the 2010 census, the population was 13,763. Its county seat is Livingston. Its name is in honor of General Thomas Sumter of South Carolina. Sumter County was established on December 18, 1832. From 1797 to 1832, Sumter County was part of the Choctaw Nation, which was made up of four main villages. The first settlers in Sumter County were French explorers who had come north from Mobile. They built and settled at Fort Tombecbee, near the modern-day town of Epes. In 1830, with the Treaty of Dancing Rabbit Creek, the Choctaw Indians ceded the land that is now Sumter County to the government. According to the U.S. Census Bureau, the county has a total area of 913 square miles (2,360 km2), of which 904 square miles (2,340 km2) are land and 9.4 square miles (24 km2) (1.0%) are covered by water. It is intersected by the Noxubee River. As of the 2010 United States Census, 13,763 people resided in the county. About 75.0% were Black or African American, 24.2% White, 0.2% Asian, 0.1% Native American, 0.2% of some other race, and 0.3% of two or more races; 0.6% were Hispanic or Latino (of any race). As of the census of 2000, 14,798 people, 5,708 households, and 3,664 families resided there. The population density was 16 people per square mile (6/km2). The 6,953 housing units averaged 8 per square mile (3/km2). The racial makeup of the county was 25.92% White, 73.17% Black or African American, 0.09% Native American, 0.10% Asian, 0.01% Pacific Islander, 0.18% from other races, and 0.52% from two or more races. Nearly 1.12% of the population was Hispanic or Latino. Of the 5,708 households, 31.90% had children under the age of 18 living with them, 36.70% were married couples living together, 23.50% had a female householder with no husband present, and 35.80% were not families. About 31.20% of all households were made up of individuals, and 12.30% had someone living alone who was 65 years of age or older. The average household size was 2.55, and the average family size was 3.26. In the county, the population was distributed as 29.10% under the age of 18, 12.20% from 18 to 24, 25.30% from 25 to 44, 19.50% from 45 to 64, and 13.90% who were 65 years of age or older. The median age was 32 years. For every 100 females, there were 84.90 males. For every 100 females age 18 and over, there were 78.20 males. The median income for a household in the county was $18,911, and for a family was $23,176. Males had a median income of $28,059 versus $17,574 for females. The per capita income for the county was $11,491. About 32.90% of families and 38.70% of the population were below the poverty line, including 47.40% of those under age 18 and 36.10% of those age 65 or over. 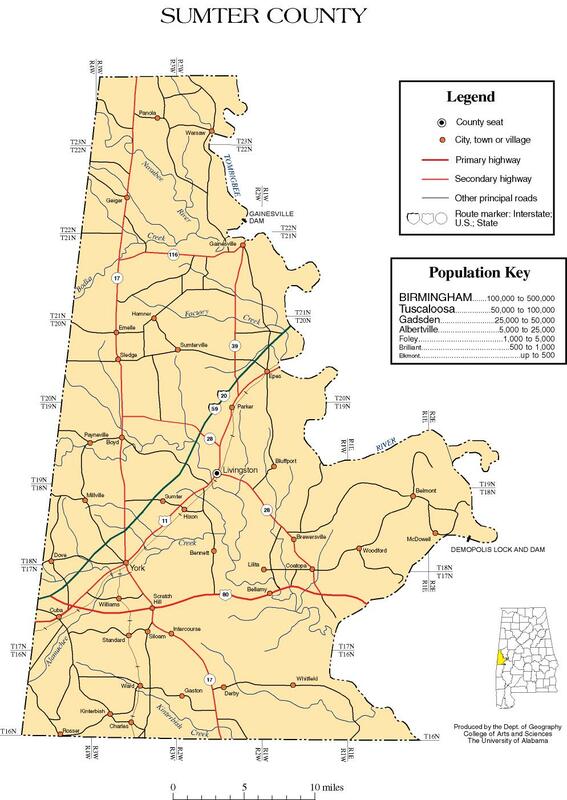 Sumter County is part of the so-called Black Belt region of central Alabama. The region has suffered significant economic depression in recent years, but in April 2008, United States Steel announced plans to build at $150 million alloy plant near the community of Epes about 50 miles (80 km) southwest of Tuscaloosa, Alabama. The plant will require 250 workers to construct in a town of only 206. Up to 235 full-time jobs will be created when completed, with jobs paying about $50,000 annually. The state of Alabama offered $28 million in incentives to get the plant located in Sumter County. The plant will make use of a new technology that produces a carbon alloy for use in steel making at the U.S. Steel plant in Fairfield, Alabama near Birmingham. At the time of the announcement, the unemployment rate in Sumter County was 6.1%. From 2009 to 2013, the county had a median household income of just $22,186 compared to a state figure of $45,253, making it the poorest county in the state. By 2015, Sumter County remained the poorest county in Alabama, with a median household income of $19,501 in comparison to the state median household income of $43,623. The University of West Alabama is in Livingston. The school district serving the county is Sumter County School District. In addition, a charter school is located on the campus of the University of West Alabama, University Charter School. Until 2017, all schools in Sumter County were in practice entirely racially segregated, as white parents sent their children to Sumter Academy, a private segregation academy set up in 1970 in the wake of a federal court ruling ordering the school district to desegregate. During the 2015-16 school year, 98% of the 1,593 students in county's public schools were black, while none of the 170 students at Sumter Academy was black. However, Sumter Academy closed in June 2017, while in August 2018, University Charter School opened, with a half-black, half-white enrollment, making it the county's first practically desegregated school. Sumter has long been solidly Democratic, having voted for a Republican only once this past century. Sumter County is home to the University of West Alabama Outdoor Sculpture Exhibition and the Coleman Center for the Arts. The historic Alamuchee-Bellamy Covered Bridge is also located on the University of West Alabama campus. ^ a b c d "ACES Winston County Office" (links/history), Alabama Cooperative Extension System (ACES), 2007, webpage: ACES-Sumter. ^ Ripley, George; Dana, Charles A., eds. (1879). "Sumter, the name of four counties in the United States. IV. A W. county of Alabama" . The American Cyclopædia. ^ Johnson, Bob (April 19, 2008). "U.S. Steel announces plant for Alabama's Black Belt region". Press-Register (Mobile). pp. 6B. ^ a b Kent, Dawn. "U.S. Steel to invest in Alabama Black Belt with first-of-its-kind coke alternative plant". The Birmingham News. The Birmingham News. Archived from the original on April 23, 2008. Retrieved April 19, 2008. ^ Frohlich, Thomas C. (January 7, 2015). "The Poorest County in Each State". 247wallst.com. 24/7 Wall St., LLC. Retrieved August 31, 2017. ^ a b Stebbins, Samuel; Frohlich, Thomas C.; Sauter, Michael B. (January 5, 2017). "The Poorest County in Every State". 247wallst.com. 24/7 Wall St., LLC. Retrieved August 31, 2017. ^ "About." University Charter School. Retrieved on January 15, 2019. ^ Farzan, Antonia Noori (August 15, 2018). "Sumter County, Ala., just got its first integrated school. Yes, in 2018". The Washington Post. 2007 map of Sumter County showing roads and settlements by University of Alabama Department of Geography.